The rain has slowed to every other day or every two days which is better, I guess, than every day. I was laughing with Kevin about the fact that we have only used our irrigation once so far this year. I am trying not to complain (too much 🙂 ) about the weather because I know that this rain will inevitably be followed by a very long hot drought. Oh Illinois…. never a balance. My good friends Jeff and Julie came up from southern Illinois last week. I always love it when they come to town because they are full of laughs, presents and great growing advice. They remind me of being young and having grandparents visit from far away, not because they are old but because they bring me gifts and smiles. 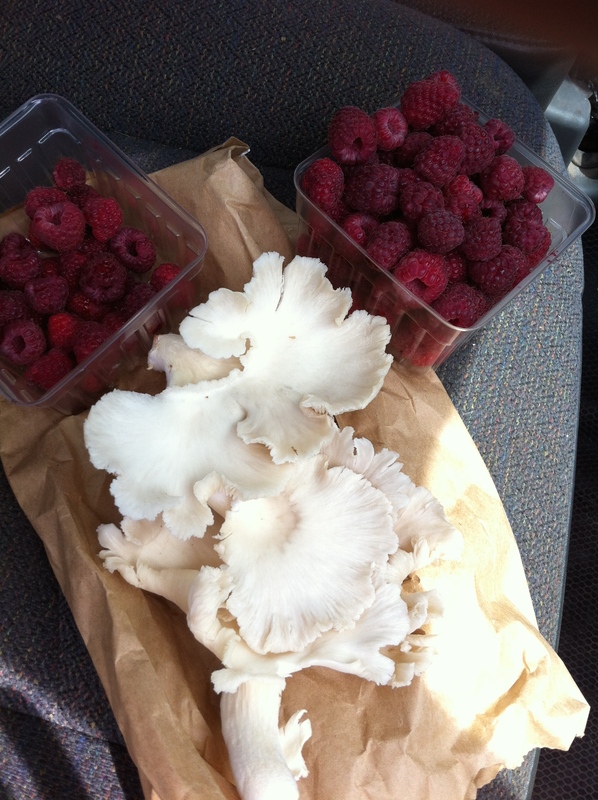 This trip they brought beautiful oyster mushrooms and juicy red raspberries. 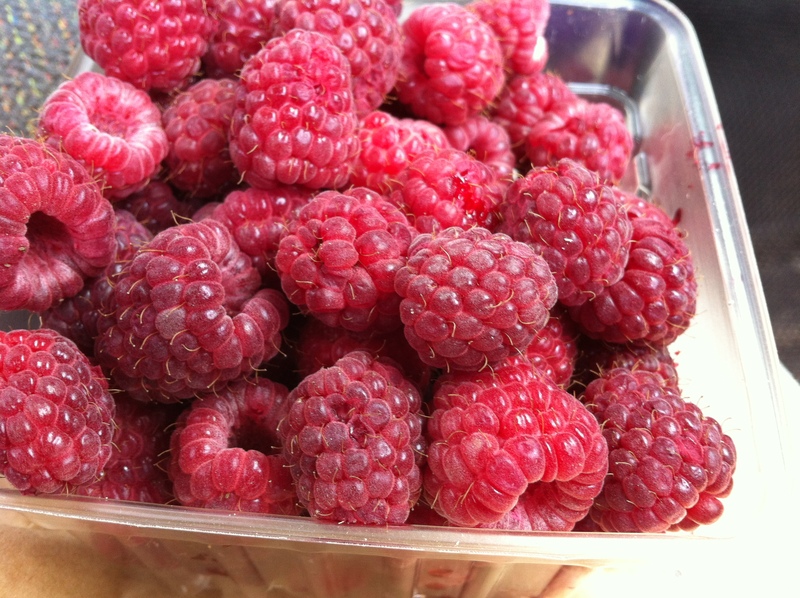 I was so excited I ate both pints of raspberries in under an hour and probably would have eaten the mushrooms as well if I had been near a kitchen. It is amazing the similarity between the culinary industry and the growing industry, in the sense that you are always eating great food! 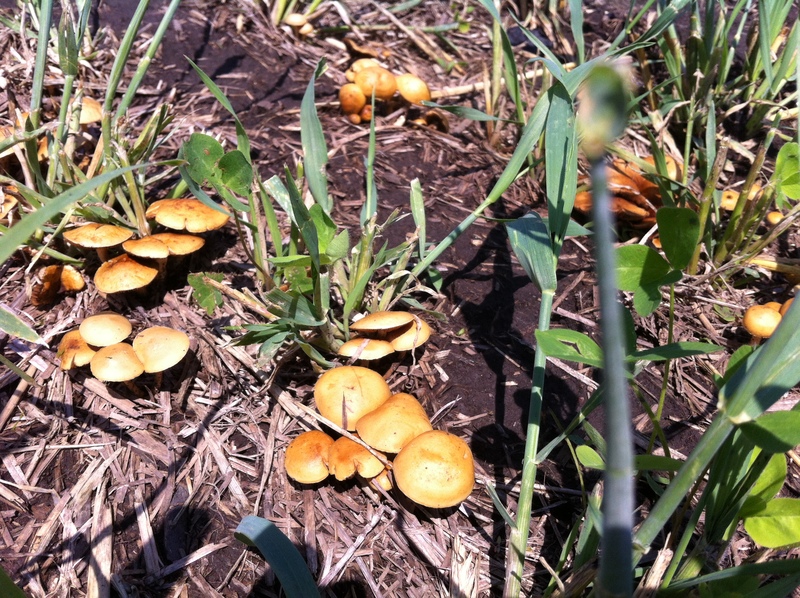 Jeff and Julie started experimenting with mushrooms last year. 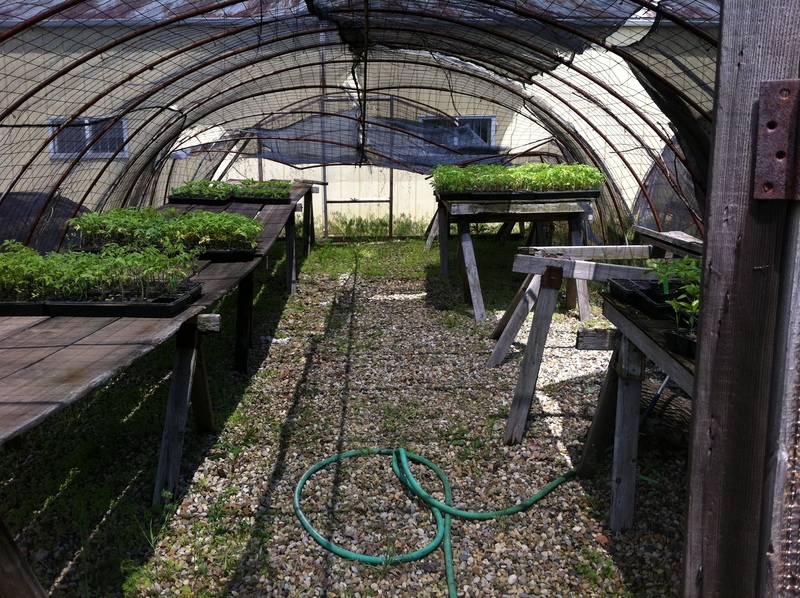 They were growing salad mix in their high tunnels and didn’t have a market for it. They knew that they had prime real estate and just needed to figure out something to grow in there. This is pretty brilliant because with the local food movement growing every day there is a huge demand for local mushrooms. 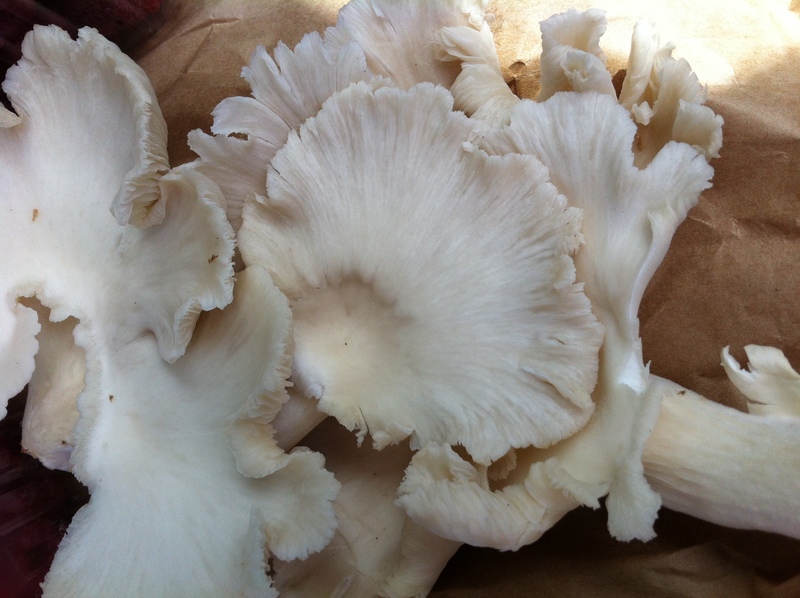 These mushrooms are some of my favorite because they are so versatile and meaty. I hope to grow mushrooms in the future once we acquire more land. I asked Jeff to walk through my plot before he headed south again. I told him of my plight with the basil and he seemed to think that if I fertilized it would definitely help my transplants. He also said that they still looked good and to wait and see what happened after I fertilized. Zack (Student Sustainable Farmer) has also been stopping by and said the same thing. This was a huge relief because I wasn’t looking forward to ripping out the beds and starting over. So, for now, we are in a holding pattern waiting to see what happens. 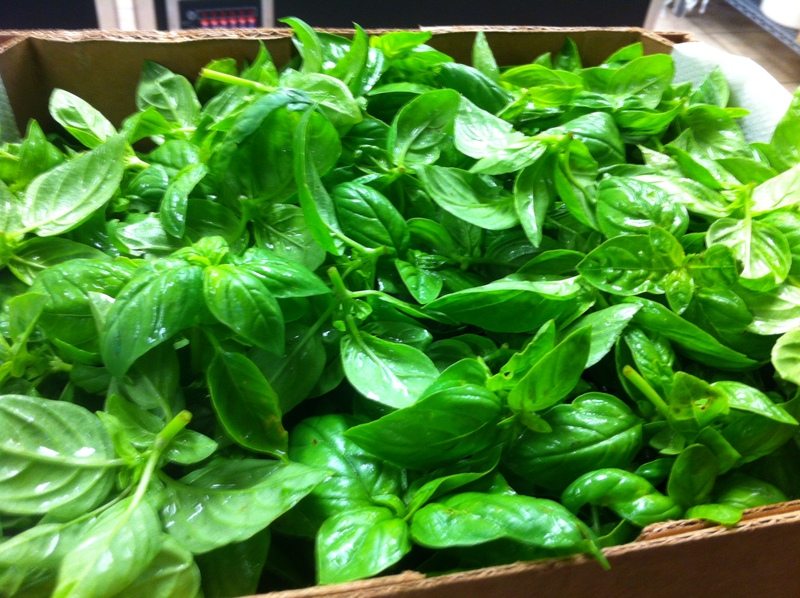 We are still harvesting once a week/ 2 weeks and last week were able to get 16 lbs, which was taken in to HH and processed into 20lbs of basil puree to be distributed throughout the school year. 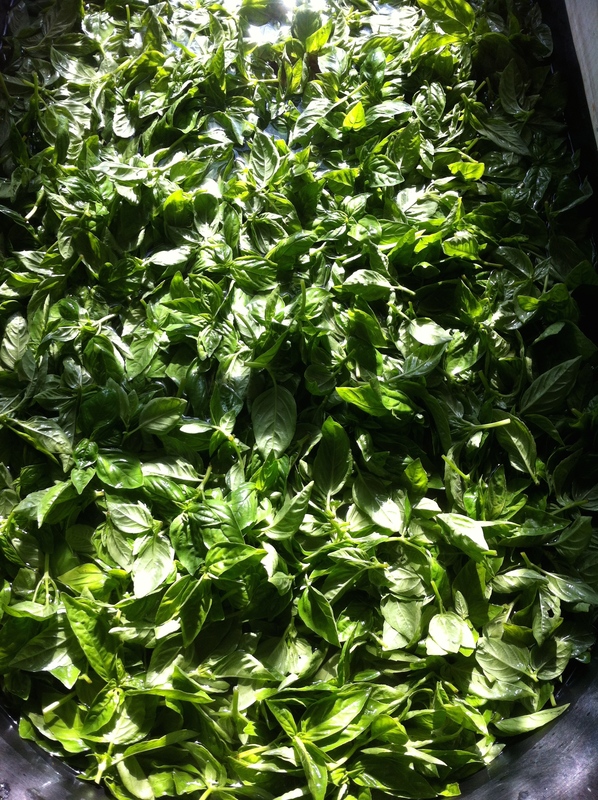 A whole lot of Basil! Jeff also asked me while he was here if I have ever played the game Hungry Hungry Hippo? I hesitantly replied yes, because I knew what was to follow. In Jeff speak, he was telling me that I haven’t fertilized enough and that my plants were very very hungry, like the hippos 🙂 . 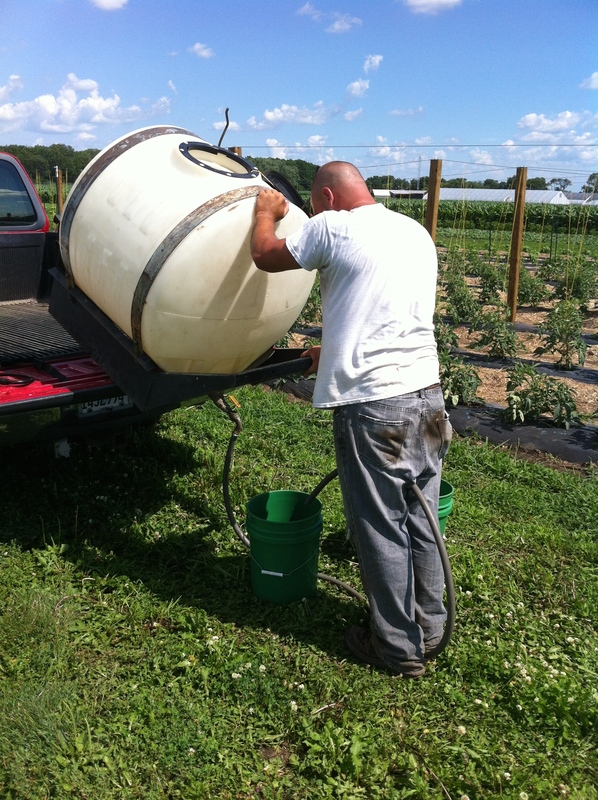 Jeremy was kind enough to lend us his 100gl tank so Kevin and I could mix our fish emulsion in that and cart it down each bed in 5gl buckets, dumping a quart onto each plant. As you can imagine, this was incredibly labor intensive and also happened to be the hottest day of the year. Fertilizing using this method is not practical for any more land than we already have. Normally people use an injector and fertilize through their irrigation. Zack was kind enough to lend us his injector for the next time. That was music to my ears considering Kevin and I went home drenched with sweat and smelling of fish. Gross! All in all it seems as though our weekly problems of fungus, pests and bacteria are under control. The plants look healthy, lush and green. 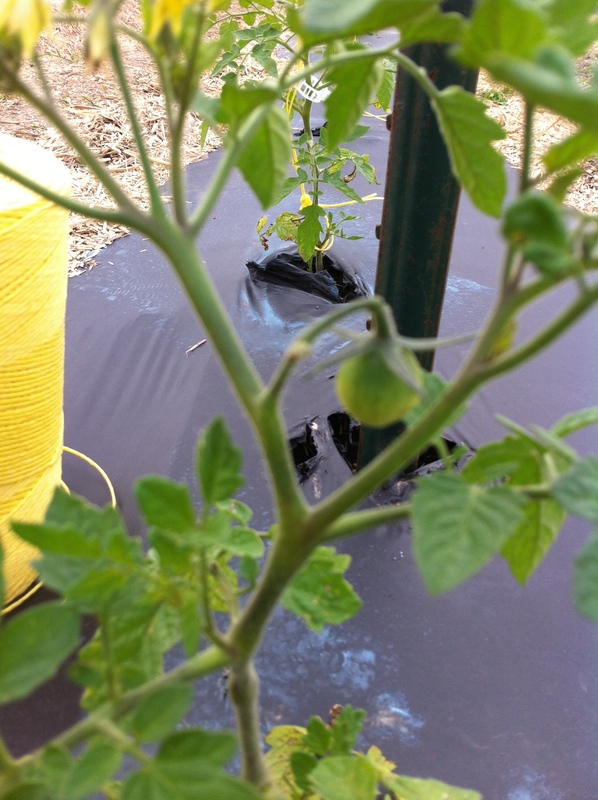 We are even starting to see some little tomatoes on the plants. Tomato sandwiches with Dukes Mayonnaise….. I can taste it already! The summer solstice has passed and it is officially summer! It has been hitting the mid 90’s during the day and everything has seemed to take off. 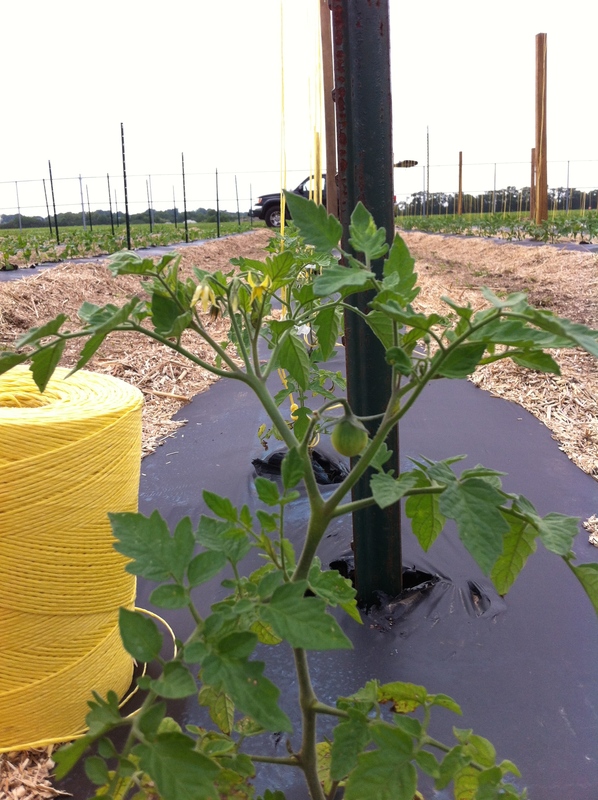 Our tomatoes are starting to get really big and we are on a weekly pruning and clipping schedule. I spotted some Black Cherry’s already on the plant so Kevin and I are counting down the days until our diets switch to cherry tomatoes. It is really amazing to see a difference in the farm from one week to the next. When I scroll through the pictures to write the blog it seems as though all of our plants are twice as big as the previous week. We had almost given up hope on the red ribbon sorrel that I had planted for farm to table dinners, but as I was weeding the bed I found them slowly starting to pop through the ground. It was a great surprise. 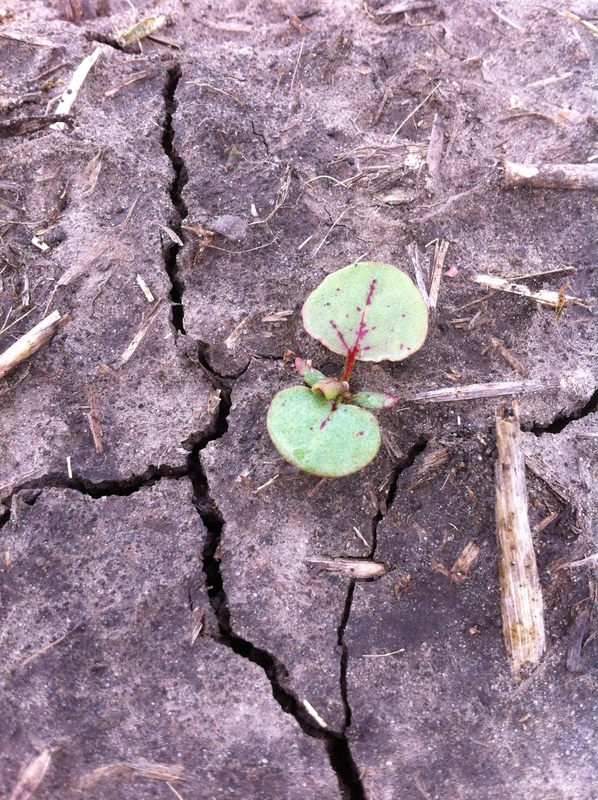 For those of you who have never had red ribbon sorrel it is amazing. The flavor is crisp and lemony. It is perfect in salads, pastas and to be used as a garnish. We have still been treating our poor peppers with copper. They look a lot better than they did last week and have gotten amazingly tall. The new growth still looks good and there doesn’t seem to be any more damage from the cut worms on the peppers or the green beans. I am pretty happy with my decision to use the permethrin and so far have only had to spray once. We had some heavy rains and winds at the end of last week. Our plot is not protected by trees so sometimes the wind can be fairly damaging. The student sustainable farm uses 1000# miscanthus bails as a wind block for their land. This might be something I need to think about when we are able to obtain a more permanent residence (aka find land of our own 🙂 ). I was worried about the tomatoes being yanked from the beds since I had already tied them to the trellising but they were fine. 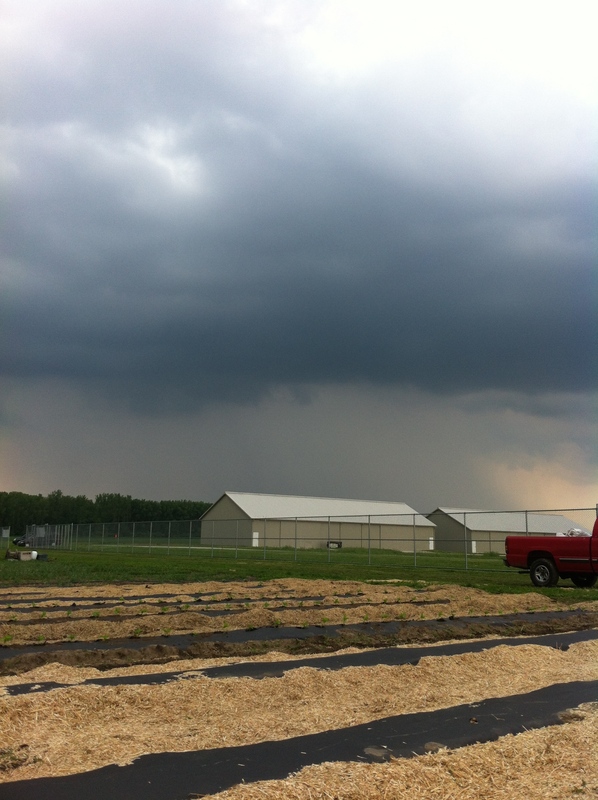 We did have wind damage to our peppers and green beans. They are just tall enough and on raised beds where they are in a perfect position to get whiplash. There was bruising on the leaves of both plants but they seem to be pulling out of it like champs. The new growth looks good and our three beds of green beans are even starting to flower. I check every day to see when they will produce. They are so delicious you can eat them right from the plant and it is not uncommon to see a certain someone walking around with them stuffed in their pockets, nibbling as she works. We did have some sad news last week. 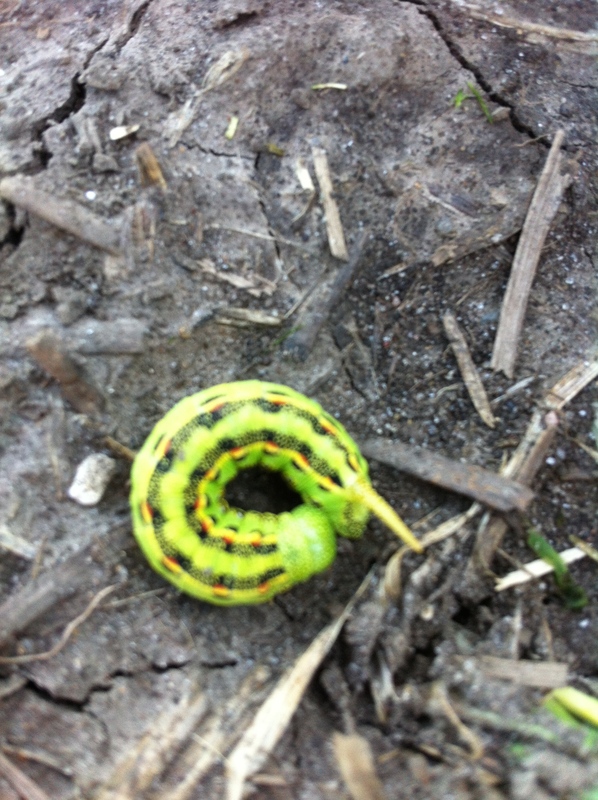 As I was scouting the plot for more disease and insect damage, I noticed an unsettling but familiar site in the basil. 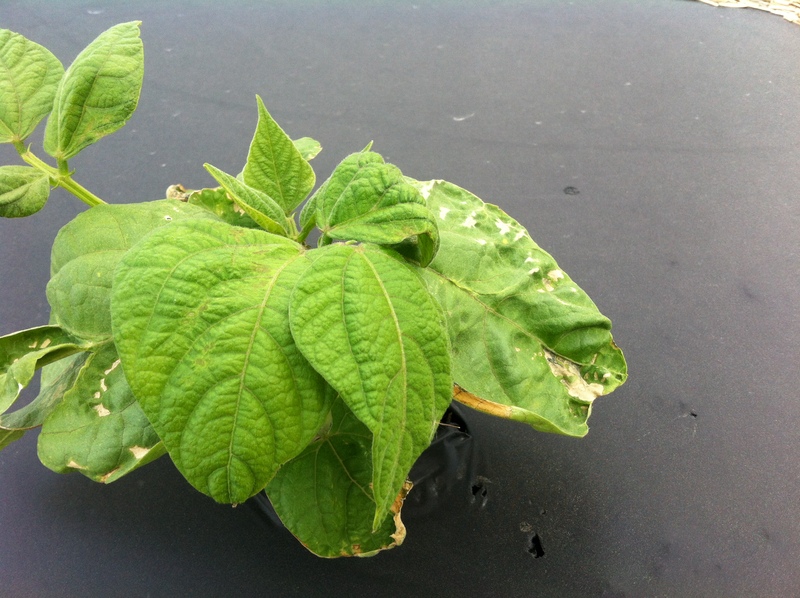 After last year when we had to rip up our entire basil crop due to downy mildew, I did not hesitant to take a sample to Rick who then passed it on to the plant pathology lab at the U of I. Dr. Suzanne Bissonnette (plant pathologist) positively identified the problem as the one….. the only…… wait for it…. YES! DAMN DOWNY MILDEW! What a disappointment this was, as I am sure you can imagine. 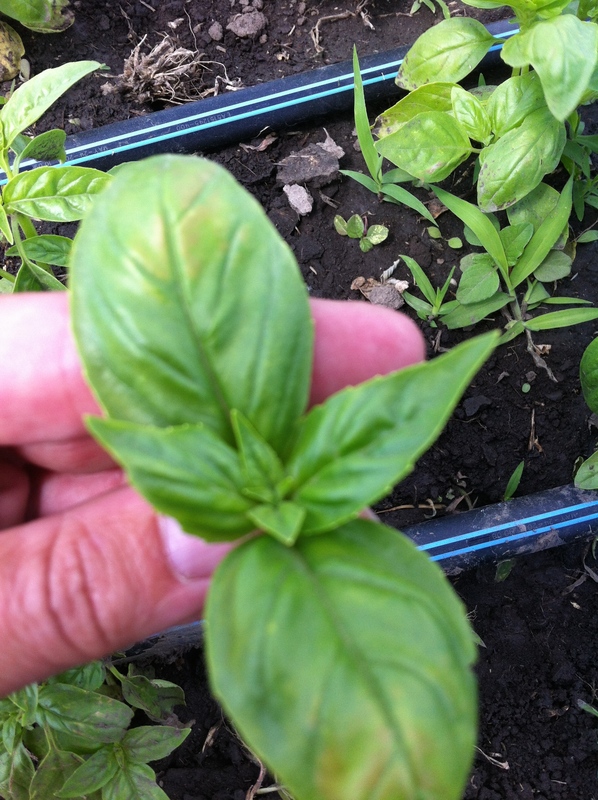 For those of you who are new to the blog this year, downy mildew is a very serious problem and poses a huge threat to Illinois since it is one of the leading states for basil production. It is a relatively new disease and was not diagnosed in the US until 2007, and not in Illinois until 2009. This disease spreads very quickly and can spread long distances by wind. One of the causes is wet growing conditions (like we had at the start of this year). 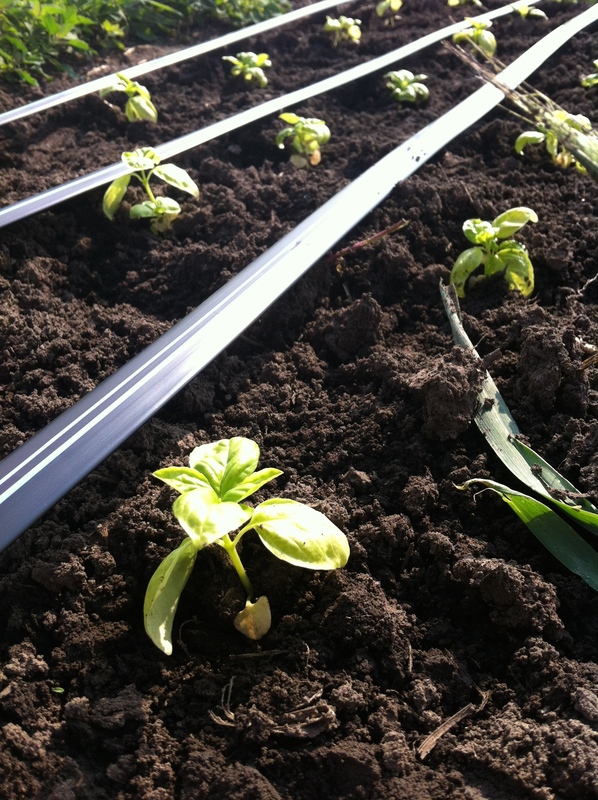 I thought by increasing our spacing between plants and rows and also the fact that we are using drip irrigation, which cuts down moisture on the leaves, that we would have a fighting chance. After speaking with a couple plant pathologists and Zack, I have decided not to purchase the organic fungicide called Double Nickel. The fungicide trials show that organic fungicide did almost nothing to help prevent or fight against downy mildew. It is also very expensive, like all organic solutions seem to be. We have already harvested some and are going to continue to harvest as much and as long as we can before we have to rip it out. Luckily a friend was kind enough to offer me greenhouse space so I will be starting transplants for the fall this week. I have to question the value of this crop to HH as I move forward and plan for next year. It has the potential to be a huge cash crop for the company and can be sold fresh or processed into puree and distributed. I really feel it is a valuable crop but not if I have to keep ripping it out year after year due to this disease which seems to be prevalent now. 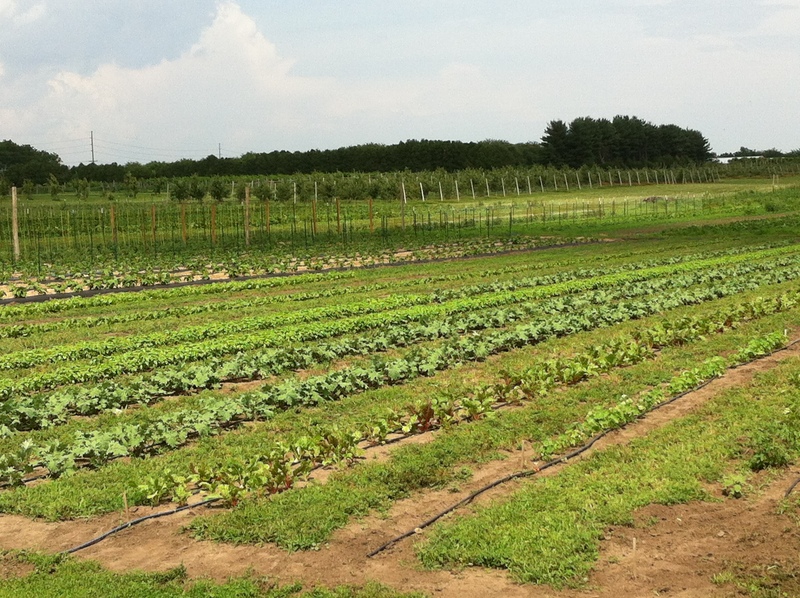 Always end on a good note….. Aside from the small basil harvests, we will be having our first real harvest of the season this week. This always makes me excited to see that our hard work paid off and we have beautiful product to sell, despite the road blocks we seem to be hitting on a weekly basis. Our spinach will be cut, washed and shipped to HH tomorrow morning after 40 days of watching and caring for it from seed. We were pushing the envelope with getting a planting in late spring so once this is harvested we will till the bed and prep it for our fall planting. Thank goodness the rain has finally stopped for a couple days. I thought Kevin and I were going to have to invest in a canoe. 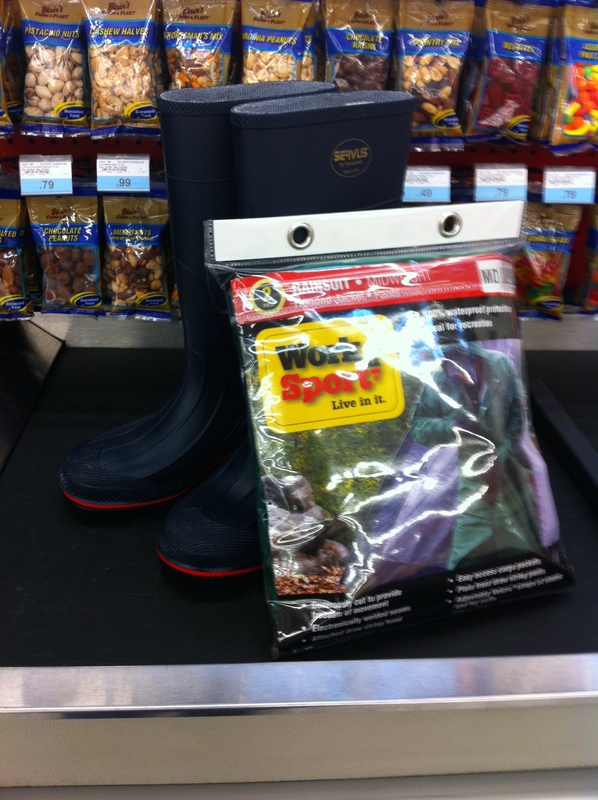 It was definitely a muddy mess and the continuous rain forced me to purchase a rain suit and rubber boots. It’s amazing how dry feet can change your entire outlook on the day! 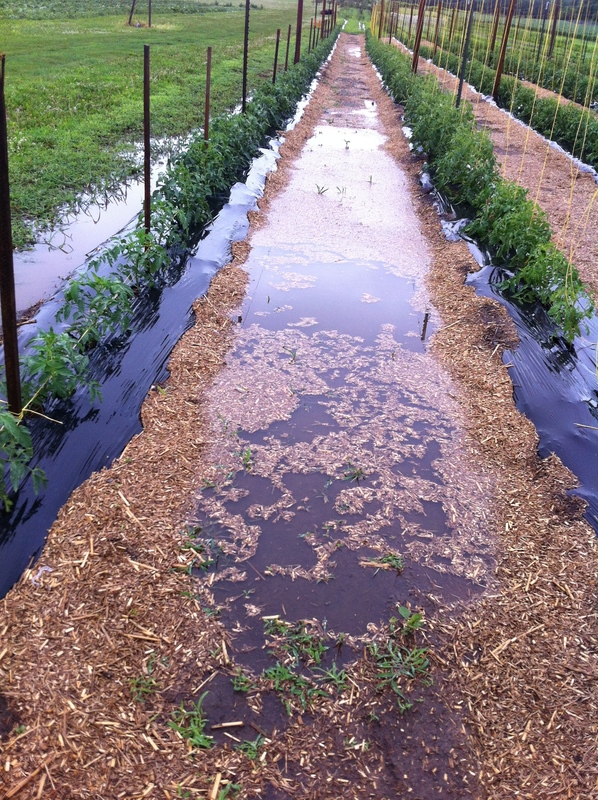 The wet conditions took a small toll on our plot of land. Some of the miscanthus that we spent a lot of time and labor spreading was washed away or enveloped by the mud. 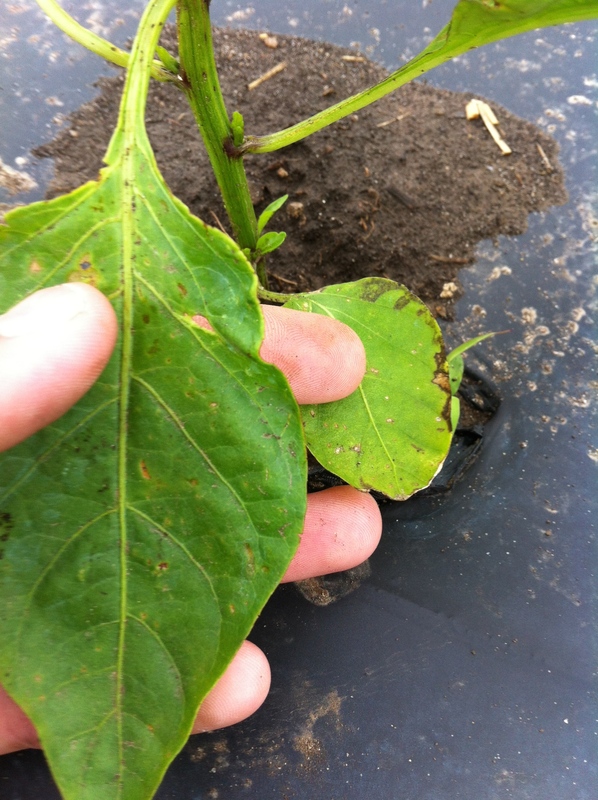 Also our old enemy, bacterial leaf spot, reared its ugly head in our pepper and tomato beds. 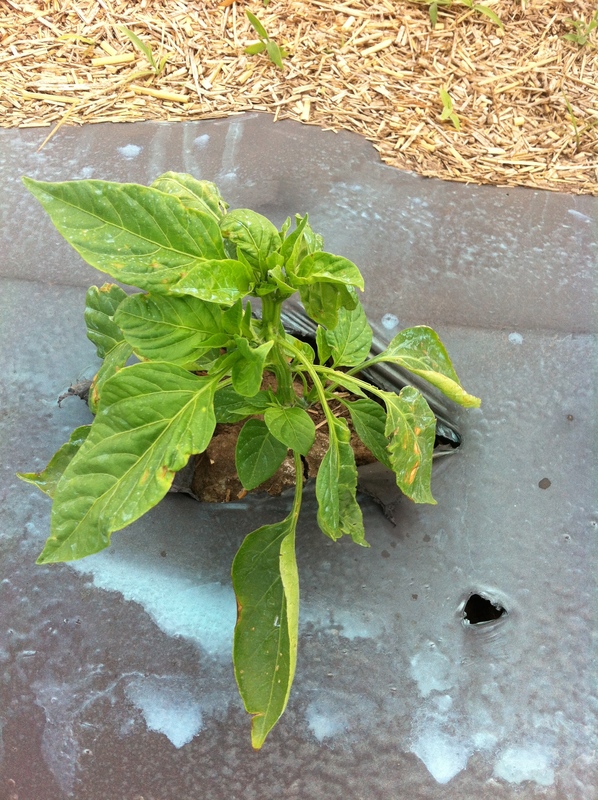 Between the cut worms and the bacterial spot, our poor peppers are really taking a beating. It stopped raining long enough to get a copper hydroxide application on and they are already starting to look better. We are going to spray twice a week until they pull out of it completely. 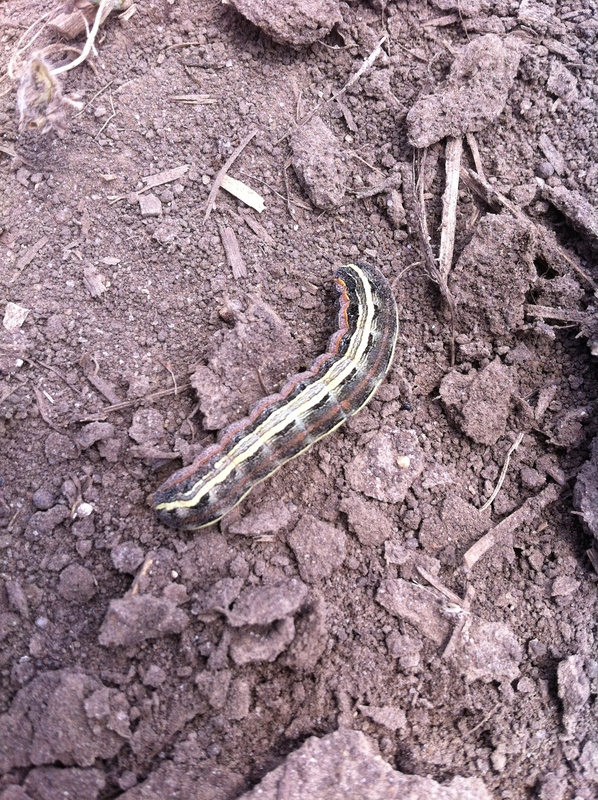 I spoke of our cut worm problem in last week’s blog post. After giving it a lot of thought and time researching the different treatments, I decided the best course of action would be to use the non organic pesticide (premethrin). The organic solution is a pesticide called Entrust, which costs $400 for 32 oz. After seeing this number, I had to reevaluate what was best for Hendrick House and the farm project with the word “profit” in mind. I am not growing on certified organic land, nor are there current plans for the owners of the land to certify it. 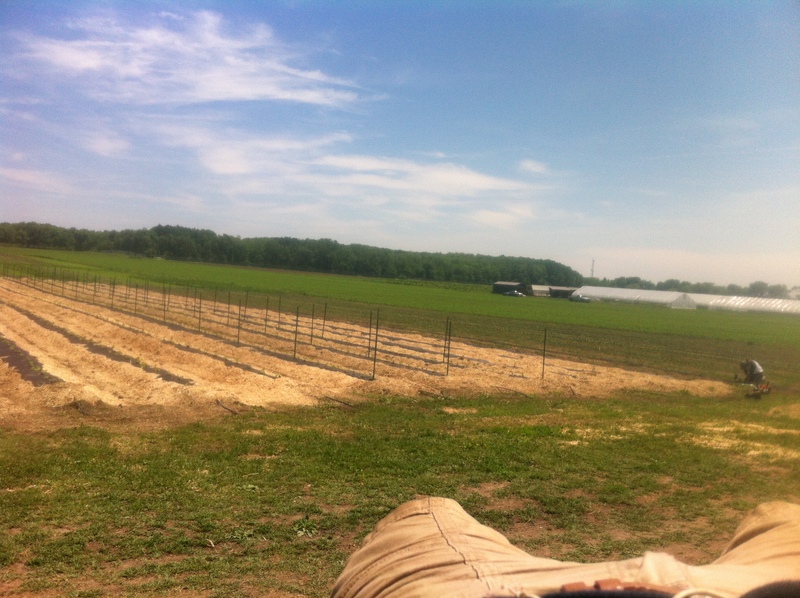 My goal with this farm project is to provide and encourage the use of fresh and local vegetables throughout the company, not necessarily organic. Ironically enough, after reading the labels on both Entrust and permethrin they both posed threats to pollinators and aquatic life. The active ingredient in Entrust is called Spinosad so I looked for other reasonably priced products that contained this primary ingredient. I did find some but the percentage was so low I was worried I would be spending my time using a treatment that wasn’t going to be effective and time was of the essence. 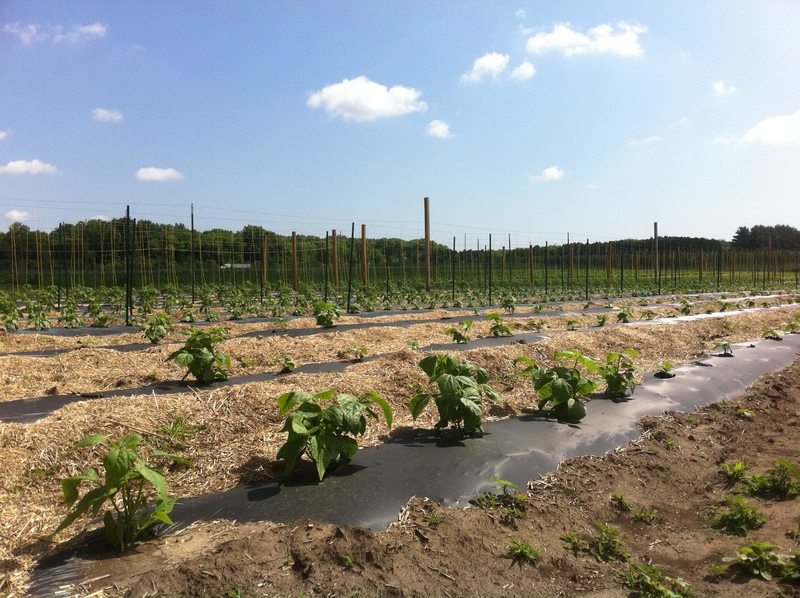 I should add that our peppers are one of the biggest money making crops we have so taking action quickly was necessary. Once I weighed the pros and cons and made my decision, I was very careful to get up early before the bees were out and I was also extremely cautious when sanitizing my backpack sprayer, making sure any remnants were going in the proper place and not where it could potentially get in nearby streams and other water sources. I believe there can be a solution to my pest problem while still being a good steward to the land. I also think it is extremely important, whether you are an organic or conventional grower, to know both sides of the organic vs non organic spectrum in order to do what is best for you and your business. It was very interesting to me to learn that organic and non organic products can potentially have the same detrimental effects to the environment. In other news, the cabbage looper is back. 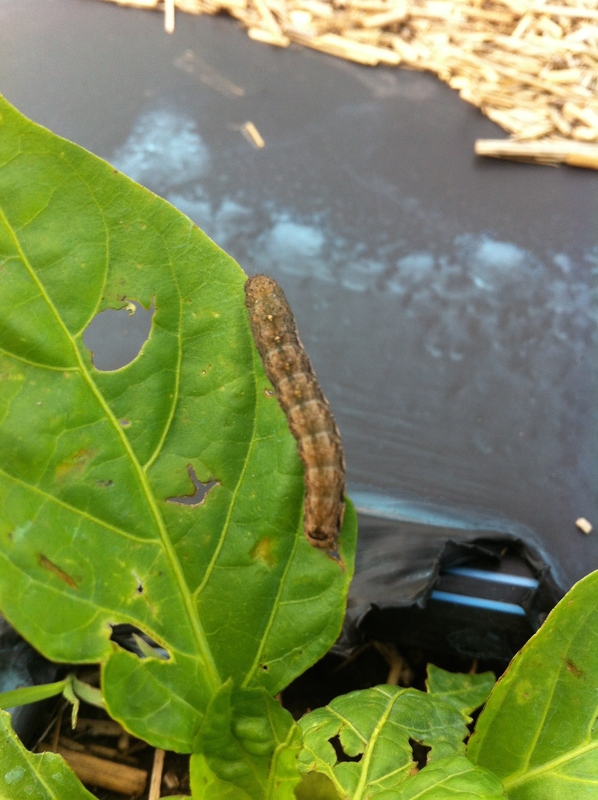 As I was cultivating the basil and kale beds I not only spotted the white moths but also the little green caterpillar. 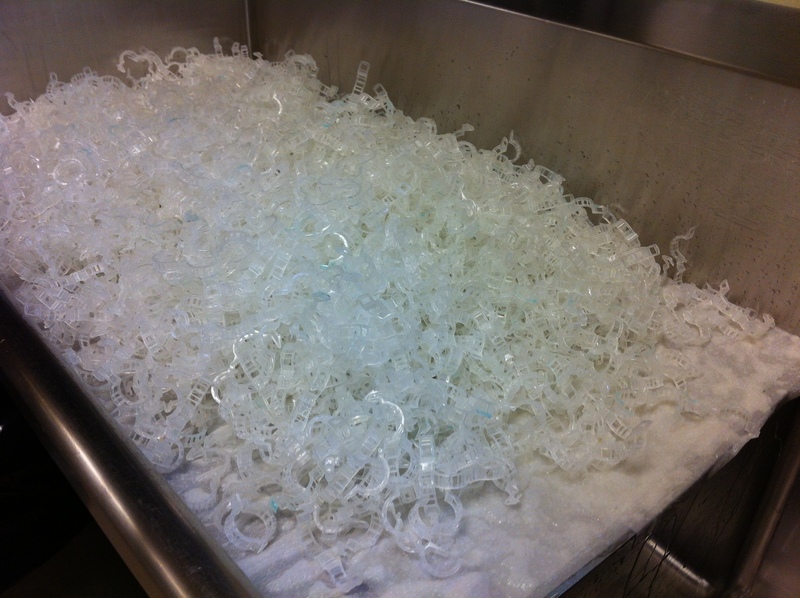 I used BT (Bacillus thuringiensis, organic pesticide) last year when we started seeing them and it worked pretty well. We will be adding that to our weekly “to do” list. I am hoping that our friends, the wasps (their natural predators), make an appearance soon. 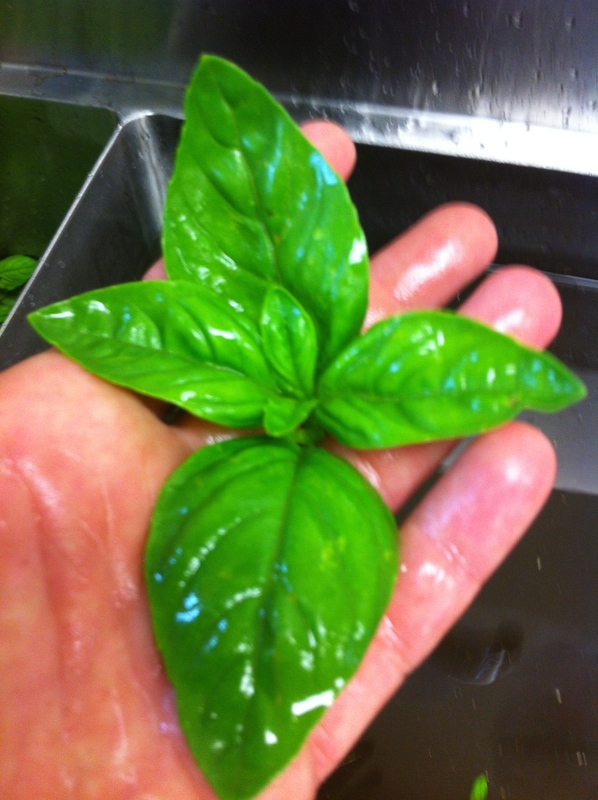 pruned the basil and were able to get about 3 1/2 #s that was taken to Hendrick House and processed into basil puree. This will then be sold through HH to our other accounts in place of buying pesto. Another way to get fresh and local through the door!! We have had an invasion of some nasty little creatures over the last week. They were unkind enough to wait until we had everything in the ground. 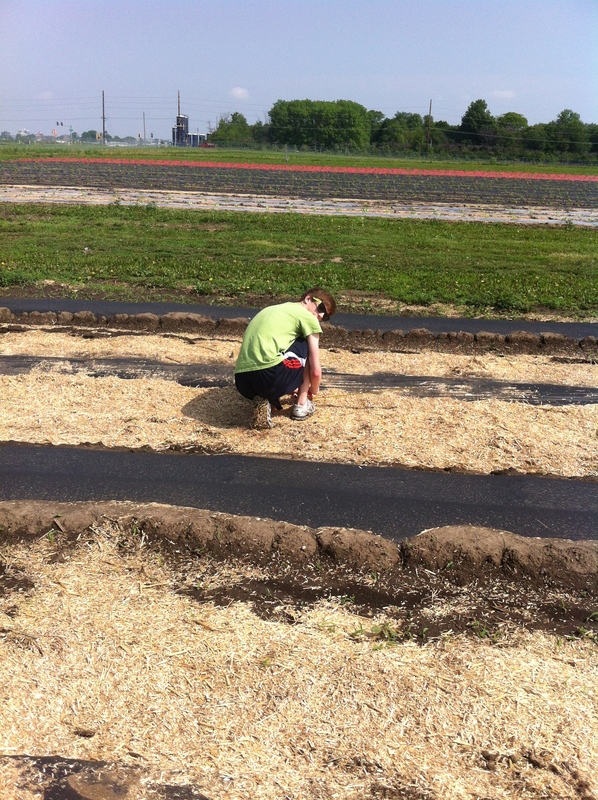 We thought we were smooth sailing with a small amount of maintenance until it came time to harvest our first crop. Well, I should have known better because it is NEVER smooth sailing. Something always happens whether it be the onset of disease, too much rain, not enough rain etc. (you catch my drift). We didn’t really have a problem with cut worms last year so I was unfamiliar to the disaster they would create. If I am going to look at this from the prospective of cup 1/2 full, then I can semi-happily say that I am still learning and will know what to look for in the future. We started to notice them in the green beans first. As we were walking down the beds it was hard not to see that more than 1/2 of our 3 beds the plants were completely missing. Upon further inspection, I saw that something had cut the top of the plant completely off and all that was left was a sad looking stem sticking up from the dirt. Luckily beans are very quick to grow so Kevin and I were able to replant at the end of last week and the new seeds germinated very quickly. 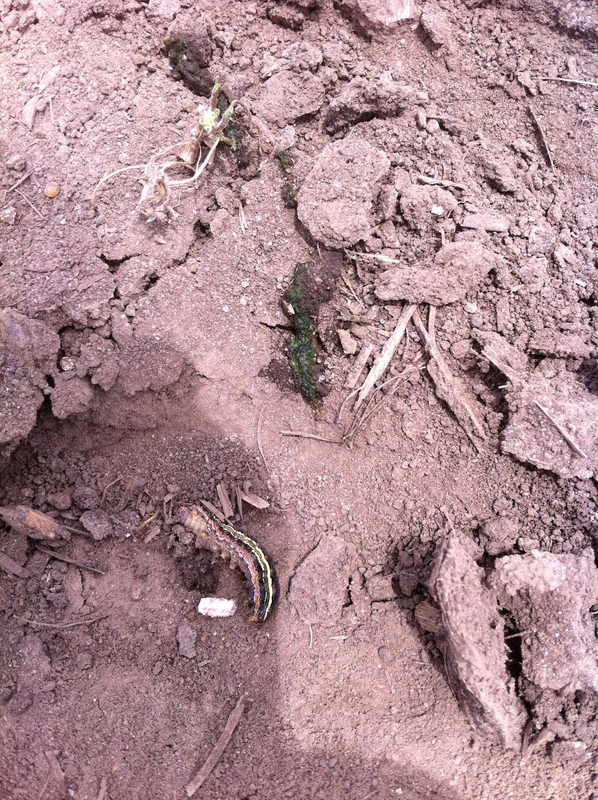 Cut worms (Army/ Striped Army) apparently do not like leftovers (they chow down and move on), which works to our favor. The new beans have been left alone so far. (Professor and Extension Entomologist, IL SARE PDP Coordinator, Department of Crop Sciences University of Illinois) to come and look at the peppers. He identified the worms and told me that the new growth on the plants still look good but he was worried about the hornworm and said we should probably take action. Thankfully they have only eaten part of the leaves of two of my tomato plants and part of my romaine heads. I should mention that killing these worms is sort of like killing a small animal because they are so big. You can feel the “pop” under your shoe and it always makes me feel bad. Also, they ooze bright green (my plants!) when stepped on. It is a very unpleasant experience! On a happier note, we got our tomato trellising up and strung with cable. Since we saved everything from last year our cost was only $24 for the ferrules that needed to be replaced. We also had some very sweet farmers volunteer their time so what took us almost a week last year was knocked down to two hours. Thank you Jeremy Shafer and Kenny Ehler!! 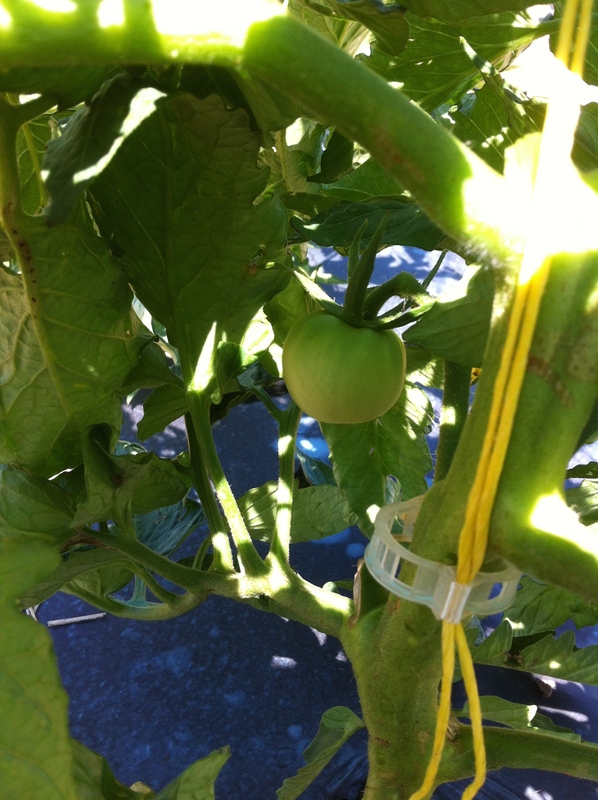 For those of you who are new to the blog there are two kinds of tomatoes, determinate and indeterminate. We are growing mostly indeterminate tomatoes which produce over a longer period of time and are pruned to a single leader. They can get up to 10ft tall. Our trellising was designed for efficiency and to withstand the weight of 10# per plant with roughly 90 plants per 180ft bed. 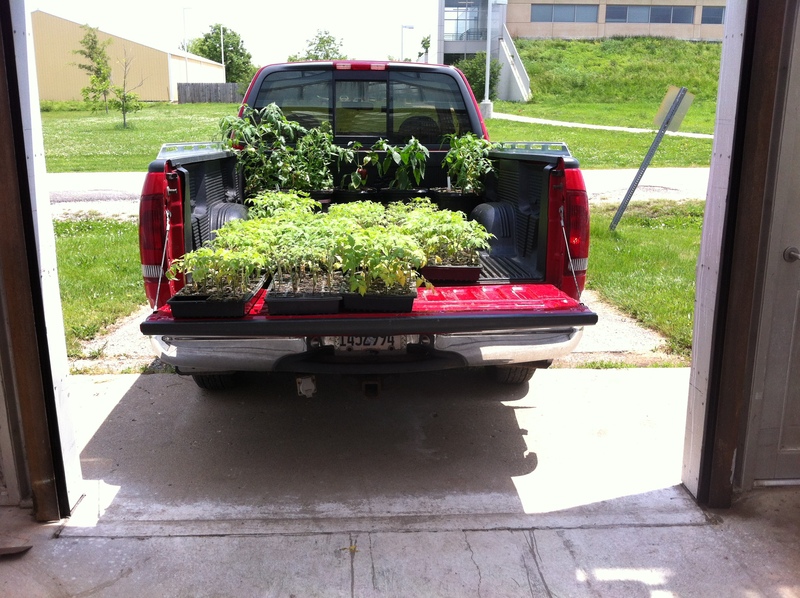 We have finally settled down from the end of the semester and planting and have established a weekly routine. 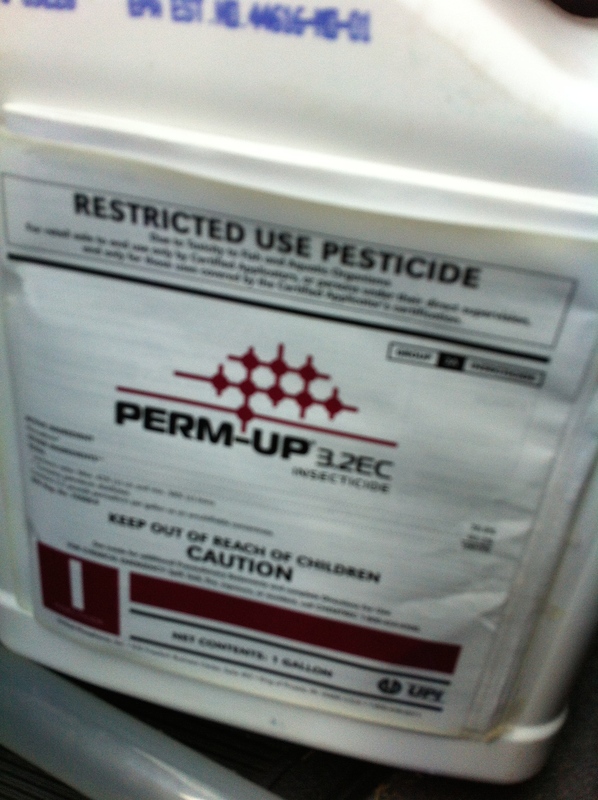 We are on a spray schedule for fertilizer (fish emulsion) and fungicide (copper hydroxide, or copper homicide…. as Kevin likes to call it). 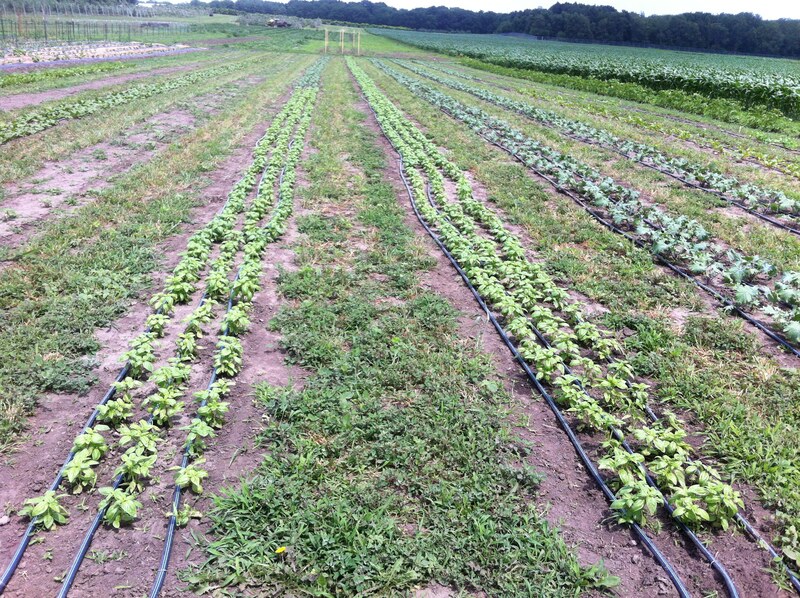 Also, since we share a high pressured water source with the other incubator plots we needed to establish a watering schedule with our neighboring plots. 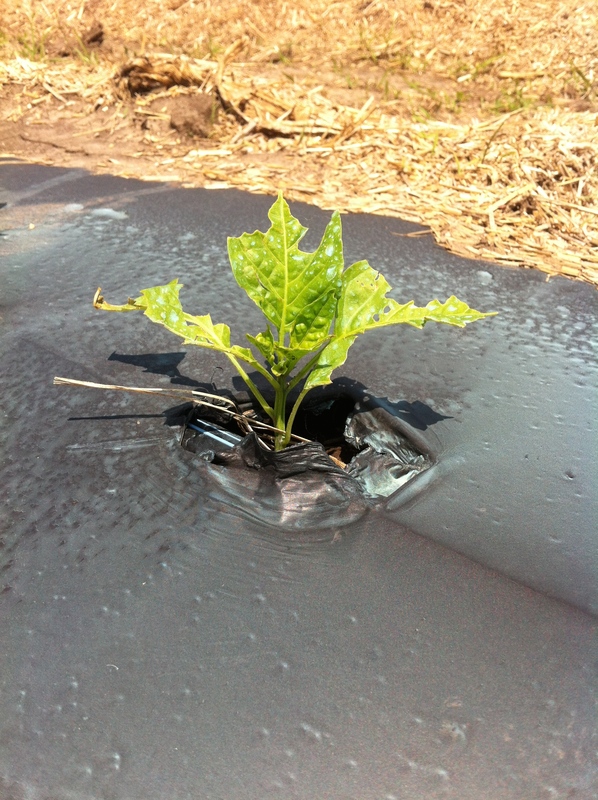 I really can not say enough great things about farming in an incubator setting. You get to meet the most amazing people who have similar interests, solving problems and figuring things out together along the way. This year I was lucky enough to have a wonderful, enthusiastic neighbor named TJ. 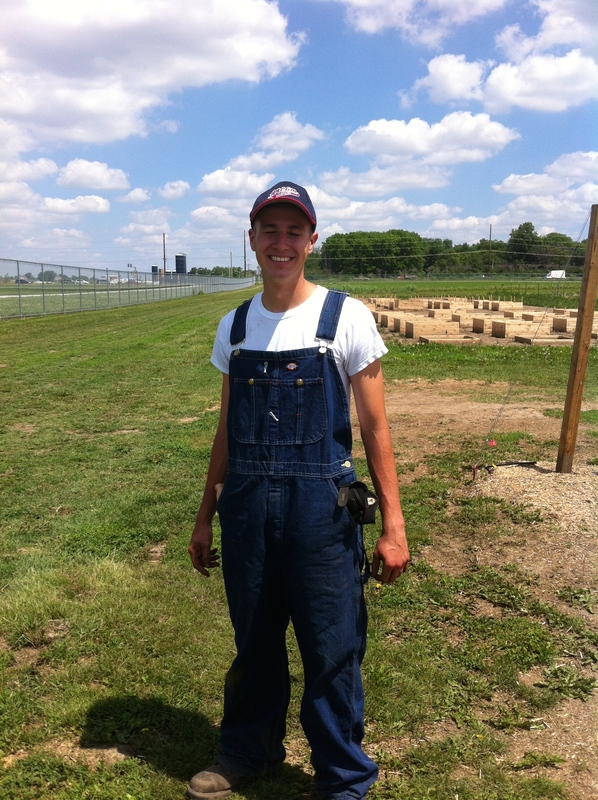 He is an absolute joy to be around, has a great sense of humor and is incredibly motivated to learn as much as possible about all aspects of growing and farming. I look forward to sharing ideas and getting to know him more as the season continues. Every seed we planted in the greenhouse this year germinated, which meant we had twice the amount of plants we needed to fill our 1/2 acre. We finished planting all of our transplants Friday and I immediately put out word that we had free transplants needing a good home. The response was exhilarating and what we didn’t donate to the open house for children at the pollenitarium yesterday I was able to give away in my driveway tonight as a small transplant/ summer party. It was really fun seeing and visiting with the variety of people from large scale corn and bean farmers to small home gardeners to local chefs. Everyone had a story and wanted to share how their season was going thus far. It was a great way to spend a Monday night. I can honestly say that I never thought I would be living in Illinois again. Growing up I couldn’t understand why my parents decided to make a life here. It was flat, boring and everyone knew everyone else. After 11 years of living some place other than central Illinois, I have a greater appreciation and understanding of this area. One of the first things I noticed when I moved back was the sky. This is the only place I have ever been where you can see for miles and miles. You can see every storm coming in on the horizon and sometimes in can be breathtaking. I was able to catch one of these storms rolling in last Thursday. Fortunately for us it did not last long and we were still able to have all our transplants moved from the shade house and in the ground by the end of the week. Wouldn’t you know it that once our irrigation was up and working and new drip tape was ordered and shipped that we would have a rain storm almost every afternoon since the beginning of last week, not needing the irrigation at all. It seems like that is always how it works. 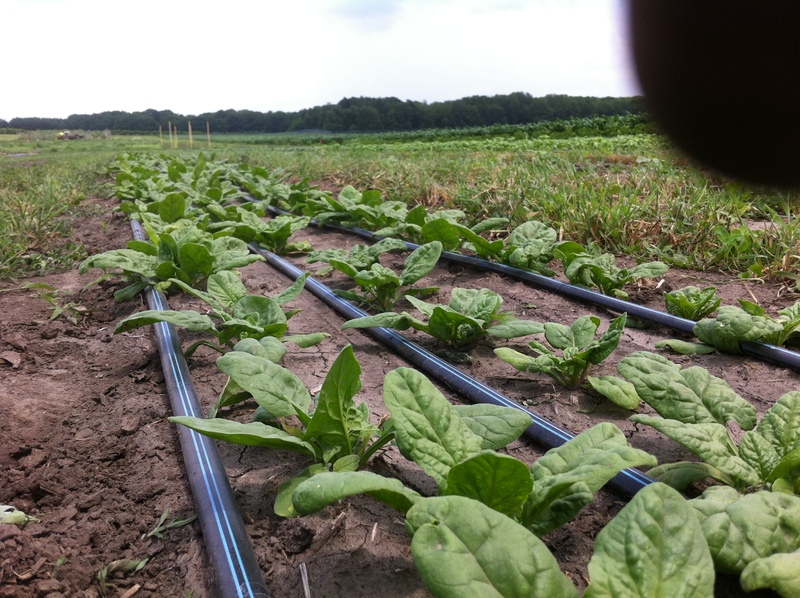 (I have always used Indiana Irrigation for drip tape and connectors. I ordered my drip tape on a Wednesday and it was at my house that very next Thursday. They are reliable, reasonably priced and fast.) Basil and Kale were the first transplants to be hardened off and also the first to go in the ground. Look who came to help! Is that Jon from AKL?!?! 🙂 We had about 1/2 the basil planted before a heavy rain hit, bruising the delicate leaves. 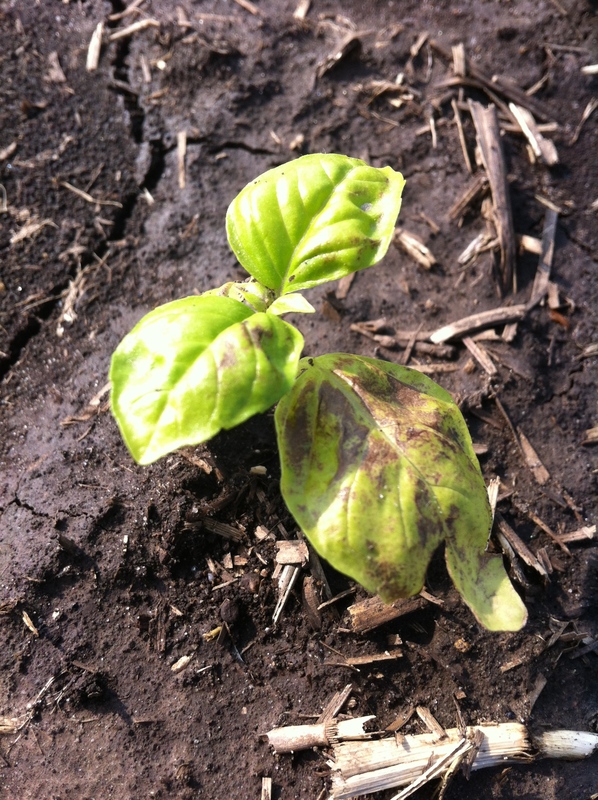 Pictured below is the bruised basil compared to the transplants we planted the day after the storm. 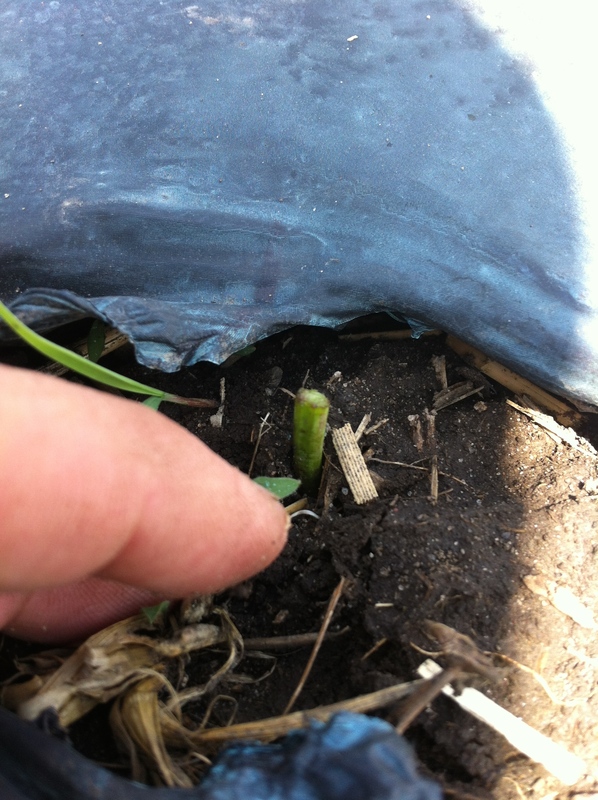 After waiting impatiently for a week to see what the new growth would do we have decided they will pull out of it. It was, as always, a nail biter. Other than being slightly inconvenient the rain has been very good for the crops on my plot and the surrounding fields. For me, as a new grower, the most exciting part is waiting for the plants to germinate. 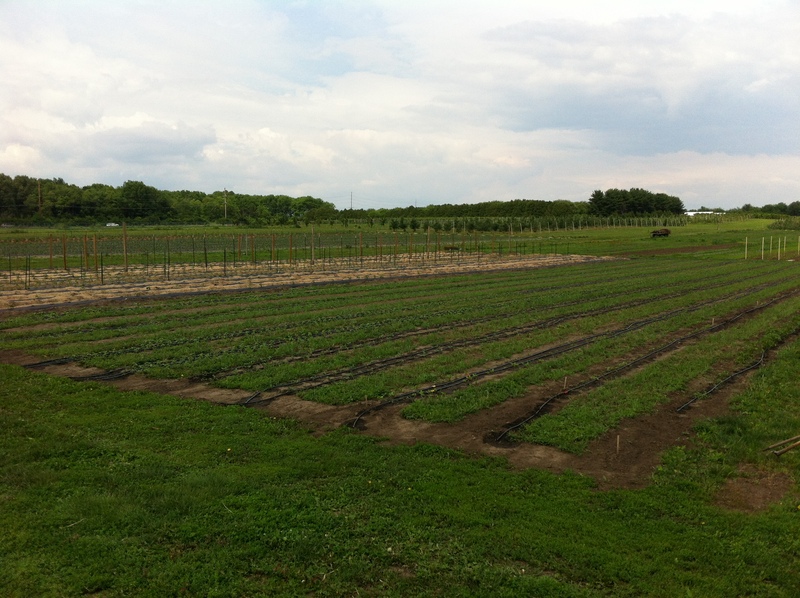 In the past couple days we have started to see life in our potato bed, chard, lettuce, spinach and green beans. We have even had a surprise crop make an appearance due to the moisture. Anyone know what they are?? The mowing of the cover crop is working famously and we have only had to do small maintenance weeding once in the last three weeks. 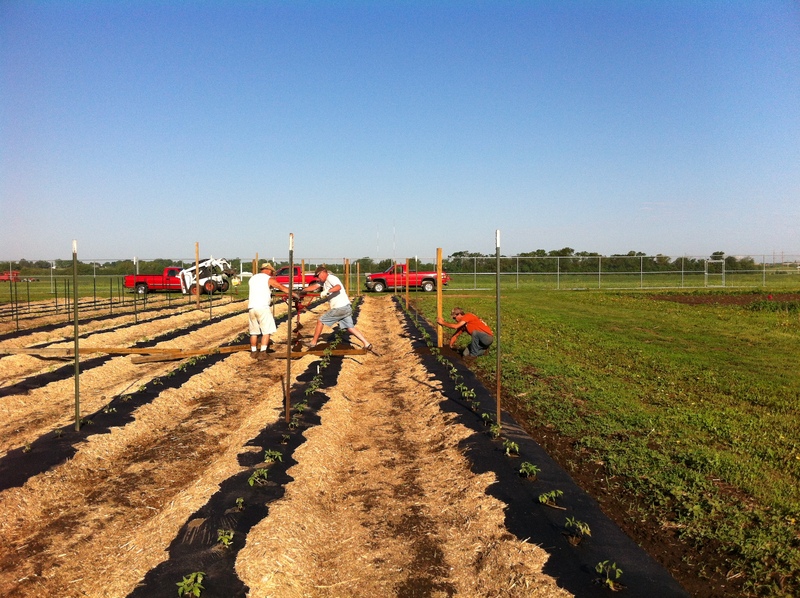 Also, now that the transplants are in the ground and the mulch is spread we have begun getting our trellising together. Our little 1/2 acre is starting to look familiar again.